The Japanese are known to be lovers and innovators when it comes to the audio scene. 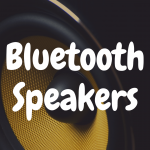 If you want to know what cutting-edge products will be reaching American shores in a couple of years, look no further than an audio show (or showroom) in that bustling island nation. Also, much of the most deftly remastered music (whether on CD or vinyl LP records) tends to come out of Japan. In fact, a lot of audio history is embodied in the company known as Denon (actually Kabushiki Kaisha Denon). The company began making single-sided disc recordings and gramophone players way back in 1910 and developed Japan’s first professional disc recorders for broadcasters in 1939. While Denon these days is best-known for trailblazing in the digital realm, the company hasn’t completely left analog behind. Far from it. There is a trio of turntables in Denon’s lineup, including the DP-300F—a very popular, midlevel machine that, at $329, nearly fills a sort of niche all its own. Afterall, automatic tables with built-in preamps are few and far between. If you’re curious about the Denon DP-300F, stick with us, and we’ll give you the lowdown on this attractive table. 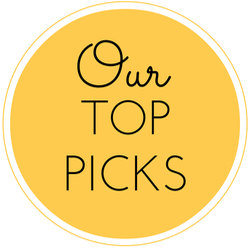 We’ll dig into the pros and cons and compare it with some of its most significant competitors. Hopefully, you’ll feel more informed and confident when it comes time make that final buying decision. Some people are just natural fumblers. Try as they might, they’re inevitably going to be the ones to spill the water at the restaurant or drop the bag of groceries (usually the one with the eggs in it). 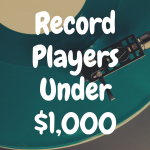 These same folks are equally liable to make a tragic goof while trying to play a record. It’s a relatively simple task, but in clumsy hands, it can result not only in scratches to the vinyl but a bent or broken stylus—or even a broken tonearm. 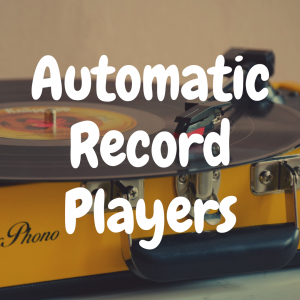 This is an attractive, black, two-speed, belt-driven, fully automatic turntable. Its headshell is removable, making cartridge replacement/upgrade a more stress-free procedure. It requires more assembly and adjustment than some others. Kudos, then, to Denon for its plain-speaking instruction manual. 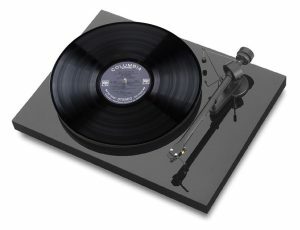 Out in the often confusing (and redundant) turntable marketplace, the DP-300F’s most direct competitor is the Marantz TT42. For one thing, they’re street-priced exactly the same. For another, they’re both automatic. The 42 doesn’t have a preamp, but, for $30 more, the 42P does. They are remarkably similar, although, to our eyes, the Marantz (gold nameplate and all) is easier on the eyes, and seems a bit more substantial in construction. 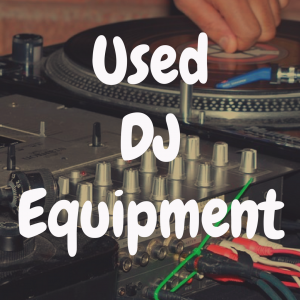 None is an automatic table, but a couple of Pro-Jects and a Rega are worth mentioning here. 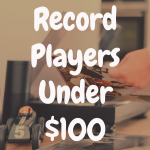 The Pro-Ject Debut III ($299) and Pro-Ject Debut Carbon ($399) have similar looks, but they both come equipped with better cartridges—Ortofon models that outshine the Denon’s no-name cart (and the Marantz’s as well, for that matter). They are also available in a selection of colors. Finally, music lovers who are (or are getting) serious about the vinyl experience are always encouraged to check out the Rega RP1. 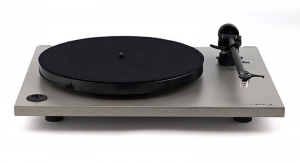 At $445, the Rega is arguably the most refined machine in its class and includes a superb Rega-branded cartridge and the maker’s highly praised RB101 tonearm. is true with almost any purchase, extra dollars will get you, well, something extra. In this case, particularly when it comes to the Rega, “difficult” vinyl will track more precisely. And, the better the cartridge, the more of that smooth, warm vinyl sound will emerge from your records and speakers. But cartridge quality alone shouldn’t be the main sticking point. Look at fit and finish, consider features, learn how easy the unit is to get up and running, and then consider swapping out the cartridge down the road. There are scores of quality cartridges on the market at wildly varying prices, and it won’t require a whole lot of bucks to upgrade to something considerably better. You can keep the table itself around for years and years. A favorite pastime of vinylphiles is posting about their thrift-store “hauls” on a favorite forum. 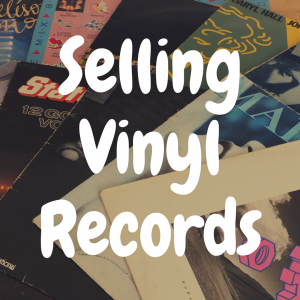 Indeed, buying used records is a hobby for its own sake, and incredible finds can be made for as little as a quarter. To test out the Denon, we pulled out one exquisite gem – a box of Tchaikovsky on no less than the Deutsche Grammophon label, a Christmas present that we hadn’t yet spun. And, there was a bonus – not only did the box contain the three symphonies the cover had promised, but a fourth LP featuring two ballets – yowza! How much did the gift-giver pay for this treasure? A grand total of one buck. Honestly, the records looked brand-new, and we decided to let the Denon handle one of our favorite pieces of music, Tchaikovsky’s Symphony No. 6, the sad one that has come to be known as the “Pathétique.” Symphony orchestras are big, and symphonic music is correspondingly big music. Reproducing it authentically and convincingly is usually a mighty challenge for stereo components, especially turntables. For starters, the automatic mechanism worked smoothly (and surprisingly quietly), gently setting the stylus down where it is supposed to – right at the lead-in groove. And we were off to the races. One thing to be aware of with much classical music is the dynamic range, the rather pronounced (and sometimes shocking) difference between the loudest and softest portions of a score. The DP-300F was surprisingly impressive in this regard, and this allowed the flat-out drama of the symphony to reveal itself. Moreover, the strings of the Leningrad Philharmonic never sounded strident, and there was an overall smoothness in the presentation from all sections of the orchestra. Stereo separation was uniformly stable and realistic. At this price point, we don’t expect to be able to keenly pinpoint the location of every instrument on the stage or in the studio, but the Denon did a yeoman’s job of allowing us to close our eyes and pretend that we were listening to real people playing. If something was lacking, it was the bottom end. No, we don’t expect a symphony to have the “bass” we associate these days with much of popular music, but there needs to be sense of power and force in the low notes, especially during crescendos. This part of the frequency spectrum was decent, but lacking in real oomph, no doubt because of the shortcomings of the Denon’s supplied cartridge. Also, the machine itself made a bit more noise than we’re used to, perhaps because of its metallic construction. It wasn’t obtrusive, but it was there. 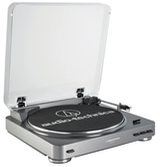 We subscribe to a “simpler is better” philosophy when it comes to turntables. Many pundits supposedly in the know believe that by adding the automatic mechanism, you’re increasing resonance and mass, as well as adding friction to the tonearm. This can intensify the danger of tracking error. Maybe so, but our two-sided symphony tracked without a glitch. 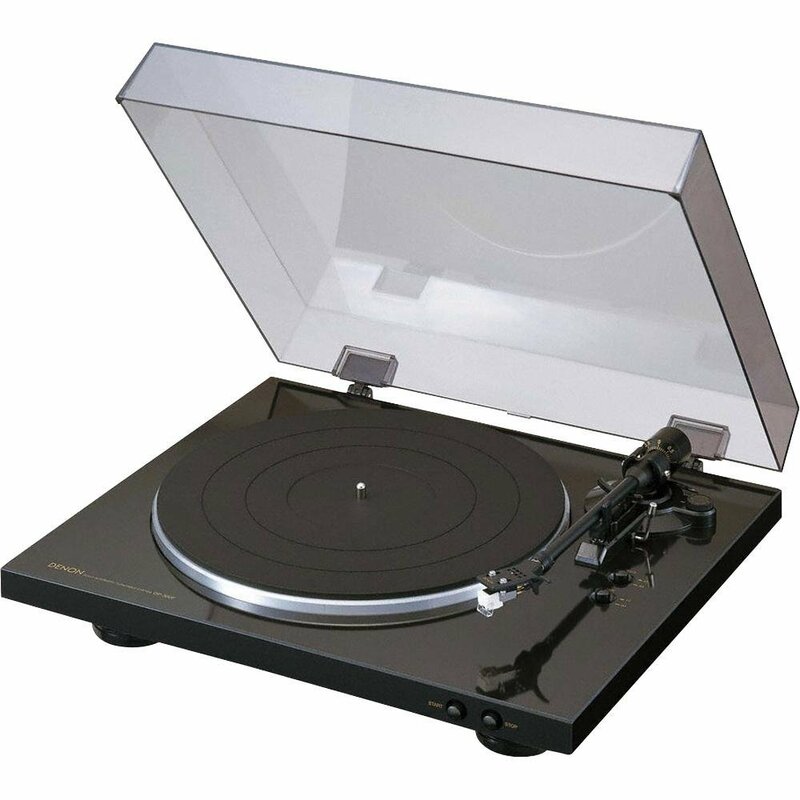 It can also be pointed out that zero truly high-end turntables are automatic. But there’s another argument against automatic – an emotional one, really. 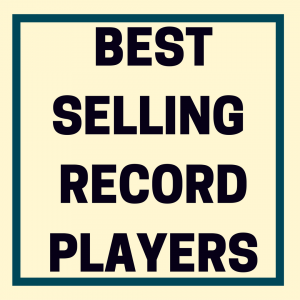 We’ve also stated in these parts that a huge reason to love records is the involvement – yes, the effort – required to (safely) play them. It’s a process so wondrous that it nearly moved one writer to tears. But different strokes and all. If you are more comfortable letting the machine get the needle in and out of the grooves, and also need the built-in preamp, well, then this Denon, despite a few shortcomings, is squarely in your wheelhouse and very much worthy of serious consideration. Did this article help you? If so, please take a moment to “like” our brand new Facebook page!